"Made from lead-free crystal, so you’ll never have to worry about impurities getting into your wine, and it’s hand-blown for that artisan feel." "Evokes the elegant lines of a graceful swan." "An all-around fan favorite no matter your style. " "Will help you properly aerate and decant your wine." "Made for elegant table settings and old-world charm." "One of the most break-resistant wine decanters you will find." "Saves space, since there’s no need for a separate decanter container or to wait for the wine to breathe." "Also makes a great conversation piece." There’s a good reason you’ll see a lot of wine decanters with a very similar shape—it works. The shape is perfect for moving the wine and for providing a large breathable surface in the container. This decanter is made from lead-free crystal, so you’ll never have to worry about impurities getting into your wine, and it’s hand-blown for that artisan feel. The decanter holds 32 ounces, but the point isn’t to fill it—it should be filled so that the wine surface is at the wide point of the decanter, and that’s exactly what you’ll get with a standard 750ml bottle of wine. Not only does this look good at the table, but it’s easy to pour from, with a slanted top that minimizes drips, and a sturdy neck that’s easy to grasp. When serving is done, this is sturdy enough for cleaning in the dishwasher, but hand washing is recommended. Not the usual decanter shape, this evokes the elegant lines of a graceful, albeit headless, swan. Described as U-shaped, it has two open ends, so you can pour easily into the large opening and delicately serve from the small opening into a glass. The large middle section easily holds a full bottle of wine, with plenty of space to spare so the wine can breathe. This is hand-blown from lead-free crystal and is designed for easy and drip-free pouring, and the design simply looks pretty at the table or behind your bar. Because of the shape, hand washing would be more efficient ​than using a dishwasher. 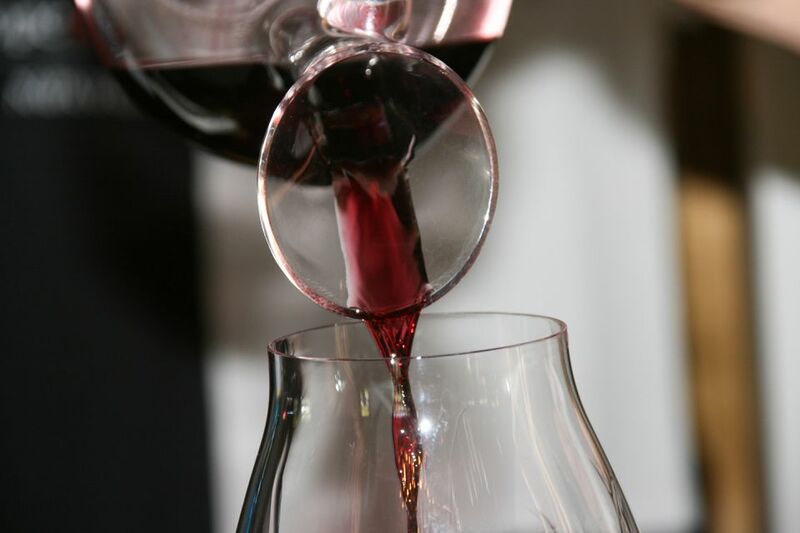 Believe it or not, the shape of your decanter can be chosen based on what types of wine you drink most often. Riedel, one of the top names in wine stemware and glassware has created a decanter that is suited for Merlot wines and they even have a Cabernet model as well. The simple design works with any type of glassware you have on your table and the shape of the decanter helps to let your wine bloom in just a few hours time. Of course, you can put other varietals of wine in here, and they also have a New York apple style that is more bulbous in shape. Reviews remark this is easy to clean (hand wash only), is great for one bottle of wine, and has a simple, yet elegant design that makes it an all-around fan favorite no matter your style. You might be familiar with the Rabbit name from their very popular corkscrews. Now that they’ve helped you open the bottle this decanting system will help you properly aerate and decant your wine. It includes a crystal decanter, a crystal wine spray funnel, and a sediment screen. The decanter should be hand washed to keep it looking its best, but the screen and funnel are dishwasher safe if you prefer. This would look unique and lovely as a centerpiece when filled with wine, or when stored in your china cabinet or wine bar. You’ll save space with this aerator since there’s no need for a separate large decanter container, and no need to wait for the wine to breathe. Simply pour the wine through the aerator and directly into your glass. It aerates the wine instantly, so it’s ready to drink, while the included filter catches any sediment that might escape the bottle. In between pours, you can set the aerator on the included stand, so you won’t get wine drips on your table. If you prefer to server from a pretty decanter, you can use one you already have—just pour through the aerator into the decanter and you’re ready to serve the perfect glass. When the night is over, it’s simple to take this apart for thorough cleaning by hand. When decanting, aerating, and letting the wine breathe is too old-school to be cool, and you just want a decent glass of wine without the fuss, this battery-operated decanter and dispenser will come to your rescue. Plus, it will make a great conversation piece. Simply place the pump on top of any wine bottle, then press and hold the button to dispense and aerates the wine by the glass. If there’s leftover wine, this seals tightly to the bottle, so you can store the bottle with the aerator attached, ready for the next glass. This comes with a soft fabric bag that will protect the metal surface from scrapes and scratches in your kitchen drawer, or toss it into a bag or purse to carry to a friend’s house on wine-and-cheese night. This includes both a hard straw and an extra-long soft straw so it can reach to the bottom of any wine bottle to remove every bit with no waste. This operates on four AA batteries, which are not included.